It's been almost exactly a year since I first wrote the original Sonic Impact T-Amp article back in September of 2004. According to the number of article accesses per month, the Sonic Impact T-Amp holds the honor of being the most popular audio product ever written about in 6moons history. What's that, you say? Yup, that's right, the $39 T-Amp has finished in 1st place in reader accesses every month over the last year except for November & December 2004 and February 2005 & June 2005 when it came in a close 2nd place for top honors. That's amazing! Heck, the little T-Rex even topped the 6moons 2005 Consumer Electronic Show coverage in January! The T-Rex didn't stop its Rock & Roll success story with 6moons either. It went on to start a worldwide sensation after traveling to Europe through the coverage of Lucio Caddedu, Carlo Morsiani and David Holgate at the Italian audio web site TNT-Audio. TNT readers were having so much fun with the T-Amp that the TNT boys started collecting reader stories about their experiences with the T-Amp so everyone could share in the fun. Guess what happened then? Well, not much really. The enormously popular T-Amp became so popular, it sold out everywhere. This tidal wave of interest was not lost upon Sonic Impact's head honcho Big Rich. While T-Amp tinkerers loved the great price and sound of the T-Amp, they wanted more: They wanted a classier chassis. They wanted better binding posts. They wanted better input connectors. They wanted an external power source. They wanted a better volume pot. Lastly, they didn't want to pay much more for it. Guess what? Big Rich paid attention and designed a new T-Amp that includes all the hotrod tricks everyone's been doing for themselves all along. Enter T-Amp II, the son of T-Rex - and its only $100 more than the original, with all the goodies included. Big Rich tells me that the new T-Amp boasts a full 15 watts per channel from its modified 2 layer board Tripath 2024 chip. The chassis is now made out of aluminum and comes with an AC power supply, has bigger and better binding posts with banana plugs and RCA inputs. 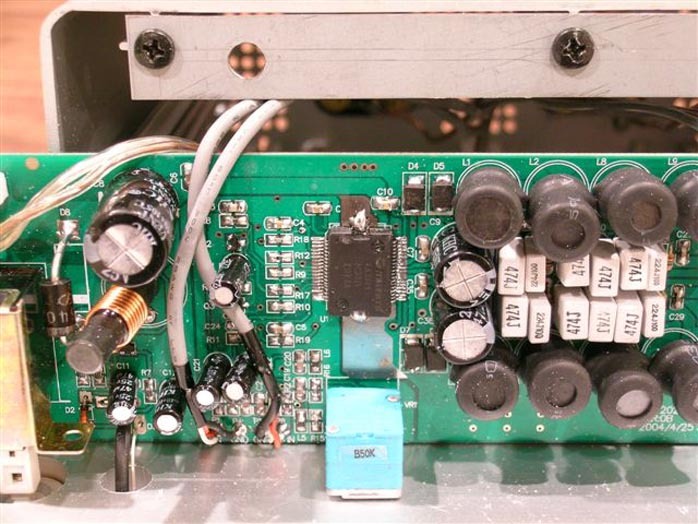 The amp is designed to sit vertically in a tower configuration like a computer CPU or a beautiful and expensive Nagra MPA MOSFET amplifier. When you pop off the back panel of the T-Amp chassis, you see a lot of empty space. The circuit board containing the Tripath chip is solidly mounted vertically in the center of the face plate, with wires running back from the circuit board to the binding posts and RCA connectors. The design work was all done in the good ol' high-tech USA, with final production in China to keep the costs down to a wallet-friendly $139 just like the T-Amp crowd wanted. I was impressed with the high quality of the chassis - better than many amps selling for much more. I had the new T-Amp in for review for awhile before Big Rich told me the retail price was $139. I was actually shocked. I figured it to be in the $300 range given its quality of construction and sound quality (more about that in a moment). I predict that the Son of T-Amp will be a roaring success just like its old pappy. Big Rich tells me he expects the amp to start shipping about the time you read this article so if you really want one before they sell out, I wouldn't wait too long. I was finishing up another review when Son of T arrived so I handed him off to audio pal Pete to listen for a weekend and get some preliminary impressions. Pete listened to it in his main living room rig which consists of a Thorens TD124 turntable, a Tube Research Labs CD player, a passive line stage made by Pete, an 845 SET amp made by Pete, a Yamamoto A0-8 45 SET amp on loan from audio pal Bill, Cain & Cain Single Ben horns and Pete's wire du jour. When I asked Pete about his initial impressions, he told me "... in the living room system, I've decided the new T-Amp has a very neutral and enjoyable tonal balance, nicer than the 845 and nicer than the Yammy A-08. I was really seduced at first by the Yammy. It took a while but even though in my living room system the Yammy had wonderful articulation and really showcases all the instruments, I came to realize that the overall effect was one of fatigue over long listening periods. The sound of the Yammy is a little bright for my living room rig. The sound of my 845 amp is distant and dark. The sound and forwardness of the Sonic Impact seems to be somewhere in the middle and quite nice. I suspect -- but do not yet know for sure -- that the Sonic Impact will not have the nuance of either the 845 or the 45 but will be very enjoyable. By the way, it does not seem to have the typical transistor amp sterility. I'd also like to hear it in Bill's system with his Edgarhorns and Stephæn's system with his Zus. I think Stephæn would take to this amp. He keeps looking for that great small and inexpensive amp..."
Intrigued by Pete's first impressions, I was looking forward to the new T-Amp in my own HiFi rigs. 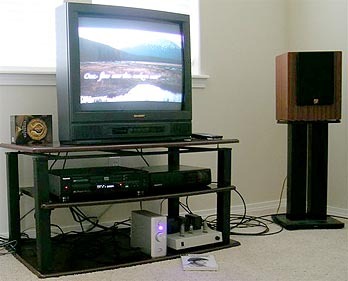 First up was my TV system of Omega Super 3s & their matching 24-inch Skylan stands, a Toshiba SD-3109 DVD video player, an Almarro A205A EL84 single-ended pentode amplifier and an inexpensive Philips television sitting on a Billy Bags TV rack. 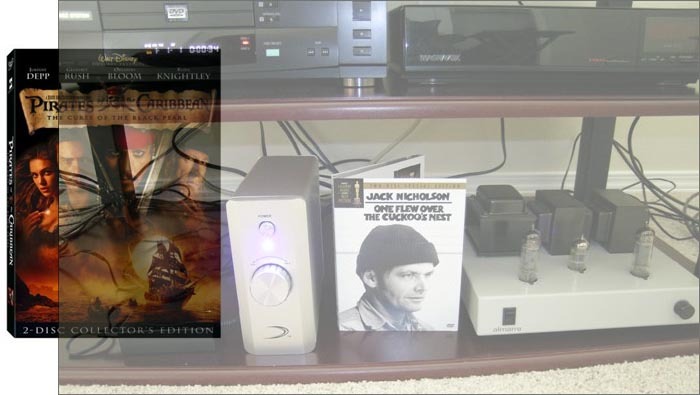 I dropped the li'l Sonic Impact in the system in place of the Almarro A205A and cued up the Pirates of the Caribbean DVD to check out how well the little amp would acquit itself. The first thing I noticed was how big the sense of space was that the Sonic Impact provided: A huge billowing and seamless sense of space between the Omega Super 3 loudspeakers. There is a lot of detail recovered as well, with all kinds of little foley details revealing themselves to provide sonic thrills. Because the Sonic Impact is so smooth, it never comes across as detailed per se. The crack of steel upon steel in the sword fighting scenes sounded remarkably real. 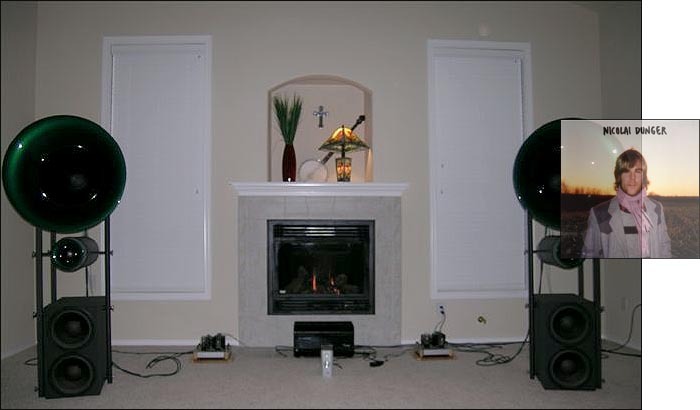 The soundstage produced was also quite good and wrapped around in front of the speakers in such a way that it almost engulfed me in the listening position of my small TV room. There was also a real sense of depth along with realistic height to the soundstage. The soundstage didn't extend much beyond the edges of the loudspeakers but that may be more of a function of my little TV room than the amp or the speakers. The overall character of the amp was neutral, not being noticeably lean or warm. It has an almost tube-like bloom rather than the touch of sterility common to many solid-state designs. Because of its overall smoothness, one could be beguiled into thinking that there is a touch of warmth there but I do not think that is so. The Almarro is warmer, less spacious and transparent and slower. The Sonic Impact betters the Almarro in all the audiophile sonic categories and manages to sound almost tube-like - not unlike a good 45 SET like the Yamamoto. On the other hand, the Almarro bests the Sonic Impact in being easier to listen to, more musical and more forgiving of a less than perfect source material. The Sonic Impact is not particularly forgiving of recorded nastiness. listening impressions. While I can't back it up with measurements, my guess is that the Sonic Impact is closer to 5 to 7 clean watts of power. 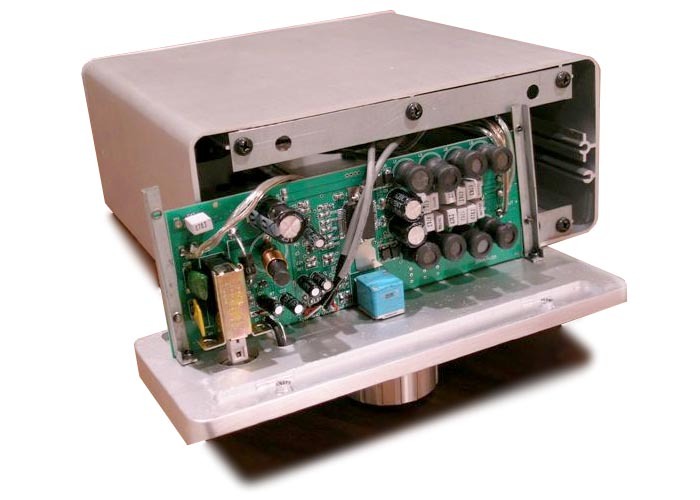 When matching the Sonic Impact to speakers, you should consider it in the same class as you would a low-powered single-ended triode amplifier. The Sonic Impact has perceptually about the same amount of drive as the 5-watt Almarro I normally use in my TV system. 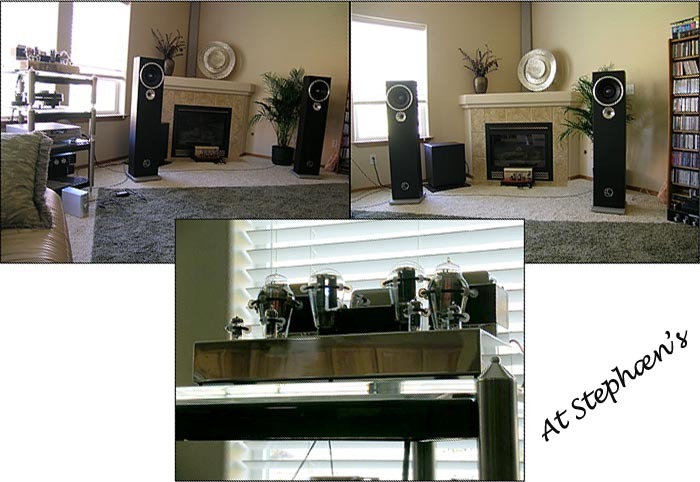 Having listened to the Sonic Impact in my TV system where it impressed me favorably, I thought it would be interesting to throw it into the lion's den of my super high performance system of $23,000 Avantgarde Duo loudspeakers and the $8000 Meridian & Audio Logic combo digital source, with 47 Laboratory interconnects and Auditorium 23 speaker cables stringing it all together. Test T's ultimate mettle. An unfair match to be sure but what is a reference system for if not to use it as a reference and take the full measure of what a product is capable of? I cued up Nicolai Dunger's Tranquil Isolation. The performance of the Sonic Impact on the Duos mirrors much of what I heard with the little Omega Super 3 loudspeakers. However, the Duos' flat-to-20Hz bass was able to reveal a weakness in the little SI that the Omegas couldn't - bass. The drum in "Hey Momma" was a bit uncontrolled & emaciated compared to my $3000 Fi 2A3 mono reference amps and quite a ways off from the sensational $8500 Tom Evans Linear A amplifier that clobbers any other amp with the level of perfection in which it handles the nether regions (or any other region for that matter). My guess? The bass deficiencies of the Sonic Impact are due to the stock power supply. DIYers will have something to experiment with after all. 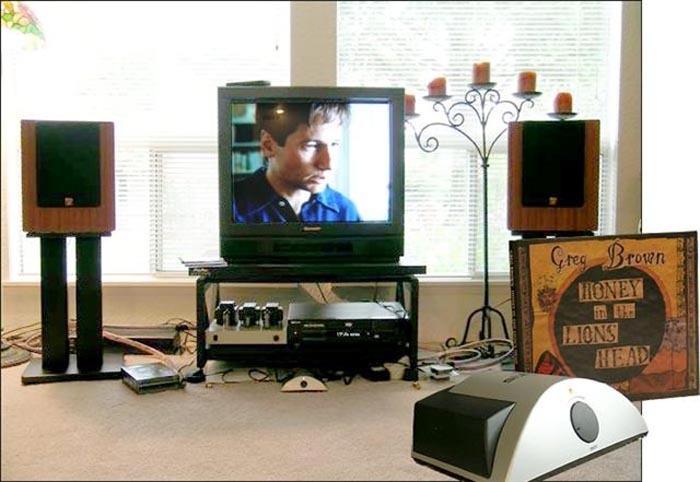 If your speakers have less deep bass extension than the Duos -- like the Omega 3s in my TV system for example -- then you might not even notice the missing oomph down low. One thing I did notice both with Duos and the Omega 3s? The Sonic Impact sounded increasingly less composed as the volume went up. While my reference Fi amps remain unruffled and organic at higher volumes, the Sonic Impact could get a little shrill, hard and forward in the upper midrange when pressed hard. I suspect the power supply. The overall tonal balance of the 2A3 Fi is warmer than the Sonic Impact and the Fi has more of a visceral flesh & blood feel to its presentation. The Fi makes the music feel more like you are listening to real live musicians. The Sonic Impact impresses you with the recordings' sonic thrills and a vivid Technicolor presentation. Neither approach is wrong unless you don't like it. In fact, you might just like the Sonic Impact better than a traditional SET just as my listening pal Pete did. The guilt-free thing about it? You will not have to remortgage your house to find out. I also took the Sonic Impact over to Stephæn's place to listen to on his Zus in place of his usual reference amp, the excellent Art Audio PX-25. My impressions with the Duos pretty much hold for the Stephæn's Zu Druids. The lack of bass oomph was even more apparent with Stephæn's sub boosted Druids than with the Duos and their active double bass modules. 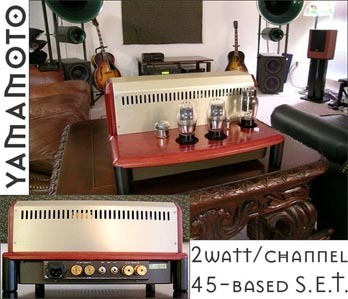 Stephæn's Art Audio amp had deep and tight bass and a nicely organic tube sound. The T-Amp sound was a little harder, a little leaner and less bass competent than the suave and expensive PX-25. Sonic Impact fans will be delighted to find out that the new Son of T-Amp is an altogether better constructed amplifier than its predecessor and a bargain at $139. The sound quality is similar to the original T-Amp although the battery- powered original might be a little smoother overall. The new T-Amp is beautifully made, reminding me of a miniature Nagra with its aluminum casework and upright chassis. Given how much nicer the new T-Amp is than the original, the price is nothing short of miraculous. You really get a lot for the extra $100. In comparisons to some very expensive state-of-art valve amplifiers like the Fi 2A3 monos, the Tom Evans Linear A, the Yamamoto A-08 and the Art Audio PX-25, the SoT acquitted itself quite well. It is not as good as those amplifiers either in sound quality or ability to play music but it is not so far off the pace as to be completely embarrassed by the comparison. Heck, golden-eared Pete actually liked it better than the Yamamoto 45 in his system, which I think is a brilliant amplifier! I think the new T-Amp is best paired with ancillary equipment a touch to the warm and forgiving side but there is no doubt about it - the new Sonic Impact is a breakthrough product that brings high performance to the unimaginably low price point of $139. This is the least expensive high performance amplifier ever made available to audio hobbyists and the easiest recommendation imaginable. I suspect it will be an absolute success for Big Rich. If you want one, you better hurry. My bet is Big Rich will sell out of the new T-Amps quick. A Blue Moon award winner if I've ever seen one!